With federal reauthorization of the Perkins Act last month, states have new flexibility in creating and implementing career and technical education (CTE) programs. ExcelinEd resources can help policymakers take full advantage of this flexibility to ensure their state CTE programs are designed to help students prepare for successful careers. Our CTE playbook series offers a practical guide of specific, sequential steps to help states better align education programs with employer demand. I’m excited to share that we’ve just released the third publication in the series, Auditing a State Career and Technical Education Program for Quality. A CTE audit can set the stage for a rich and robust examination of a state’s current CTE program by identifying what the program is achieving and whether or not those achievements are fully aligned with the state’s education, economic and workforce priorities. 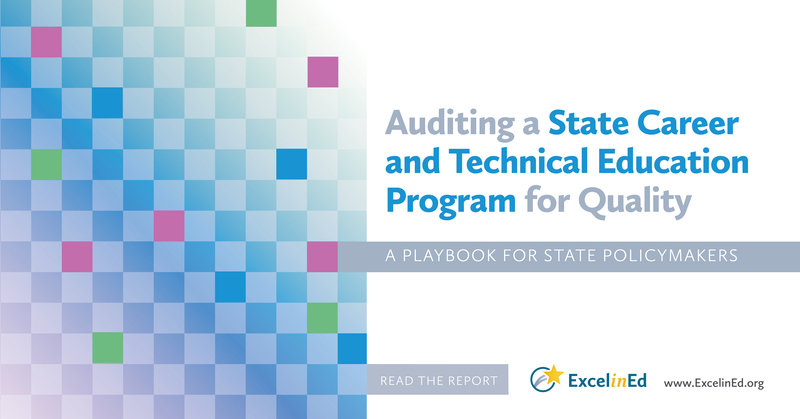 This new playbook guides state policymakers through a three-phase audit process to assess CTE program quality, alignment and overall effectiveness. We hope you find this resource useful. And as always, please let me know how ExcelinEd can support your work to advanced student-centered reforms in your state!